Indiana Governor Mike Pence is expected to be formally named as the vice presidential nominee at the Republican National Convention Wednesday night. CLEVELAND — Mike Pence had just lost his second attempt at winning a congressional seat. He was sitting in a law office in Indianapolis when the phone rang. A woman in Rushville — a small community an hour away — was on the line. Disinger wanted Pence, the guy who she knew as the wholesome candidate who rode a bicycle around campaigning with his wife, to start a new show on her small radio station. She mentioned to him that one of his heroes, Ronald Reagan, also used a radio show to springboard to political prominence. For Pence, who will be nominated Wednesday as the Republican vice presidential candidate, the radio opportunity marked a crucial turning point. He would largely abandon his legal career for one in talk radio, honing his skills as a communicator, building his name recognition, and testing out his conservative political views. 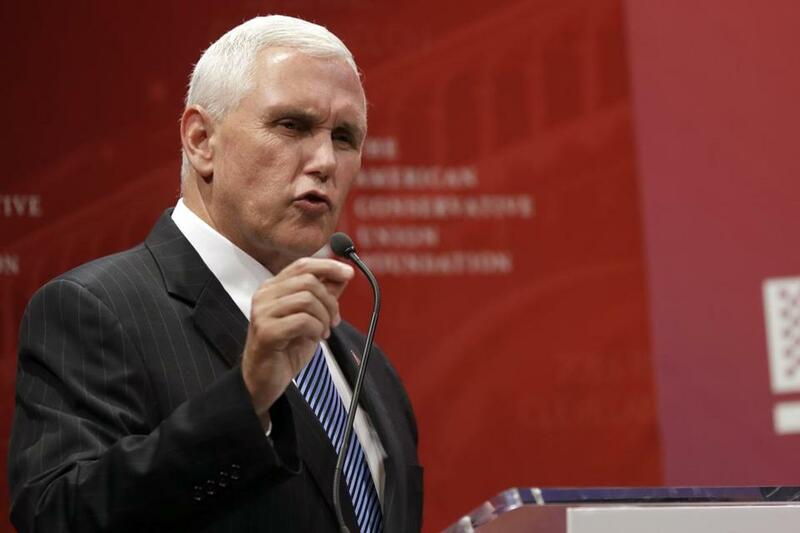 Now, Pence is stepping into one of the most prominent roles in American politics. Pence grew up in Columbus, Ind., a small town about 40 miles south of Indianapolis, in an Irish Catholic family. While attending Hanover College, he grew more religious and more conservative. After marrying his wife, Karen, and earning a law degree from Indiana University, he started in private practice before running for Congress. In 1988, he ran against Democratic incumbent Phil Sharp, hoping to win in a Republican-friendly district. He lost by seven points. In 1990, Pence ran again against Sharp, but this time the campaign took a brutal turn. Pence ran a television ad in which a man dressed like an Arab sheik, and wearing sunglasses, thanked Sharp for dependence on foreign oil. Pence lost by nearly 20 points. And by the end of it all, Pence was ashamed of the way he had conducted himself. He wrote a letter of apology to Sharp, and also wrote an essay called “Confessions of a Negative Campaigner” that summed up his feelings about his early foray into politics. It wasn’t long after that loss that Disinger and her husband sat with Pence for dinner at a fancy restaurant in Indianapolis. Pence was convinced to co-host the radio show, which would be thick on policy and updates on national politics. Occasionally, callers would turn slightly hostile, and there was a button ready to press if someone used a profanity. But Pence himself usually bit his tongue. It was the early 1990s, and the political mood was not as antagonistic. Doing Disenger’s show was a once-a-week commitment and, eventually, Pence wanted to make it a career. Soon, he worked his way to a bigger network, with affiliates all across Indiana. His producers thought of “The Mike Pence Show” as a daytime version of Larry King. Pence, though, said he wanted to be a Midwestern version of Rush Limbaugh. He started with a half-dozen radio stations, but that would grow to more than 20. Pence suddenly had a statewide audience, listening to him for three hours every weekday morning and providing an unmistakable boost to his political career. In 2000, a congressional seat opened up again. Rushville, the city where he got his start on talk radio, was at the center of the district. Pence handily won. Shortly after taking office, he created a small radio studio in his congressional office so that he could regularly appear on Indiana stations, according to a 2001 story in the Indianapolis Star. He was the only congressman with such a setup, but he would go on to coach his colleagues on how to use the medium. Compliment your host, he told them, according to the Indianapolis Star. Speak in short, quotable sentences. And don’t try to be funnier than the host. When Pence takes the stage Wednesday night, he will be following that same advice, trying to compliment, but not overshadow, the man at the top of the Republican ticket.